UAE sports leader, Mohammed Khalfan Al Romaithi, promised to clean up and unlock the potential of the world’s biggest football continent as he launched his campaign bid to become president of the Asian Football Confederation (AFC). In a powerful ceremony at the Louvre Abu Dhabi on March 7, the candidate pledged to “make significant levels of new investment for every Member Association, increase participation at all levels of the game” and introduce genuine “transparency and independence”. Al Romaithi’s bold election campaign manifesto for change, ‘Making Football Fair,’ was unveiled at the Louvre launch, heralding Asia’s first contemporary continental blueprint for football development. Al Romaithi is adamant that now is the time to throw off years of inadequate investment and poor governance, which has stalled the development of the world’s most popular game in the world’s biggest football continent. 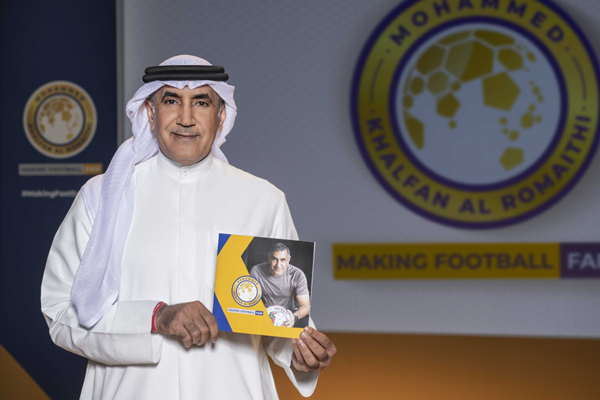 In a move not seen before, Al Romaithi, who is the chairman of the General Authority for Sports in the UAE, unveiled a comprehensive, fully-funded manifesto designed to make football fair for all in Asia, and more competitive internationally. Under Al Romaithi’s leadership the AFC would become the most “inclusive and independent” football confederation in the world. “I have seen first-hand how the power of football can change the lives of everyone for the better, but in Asia this power has been abused to the detriment of our people,” Al Romaithi said. “Now is the time for change, now is the time for a new era, now is the time to make football fair for all,” he added. • To make football fair for Asia’s youths by establishing annual competitions for all age groups from U14-U23. The Al Romaithi manifesto is designed to “bring Asian football into the 21st century,” and is the first contemporary strategic plan devised to develop football in Asia. The ‘Making Football Fair’ manifesto empowers member associations with the means to do what has never been done before: win the FIFA World Cup for Asia. “I want every boy and girl from every nation, from every faith and of every age to have the chance to play football and dream of one day lifting the World Cup,” Al Romaithi said. For the first time, 25 per cent of each Member Association’s annual investment from the AFC will be ring-fenced for the development of women’s football. This, along with promises to expand the AFC Women’s Asian Cup, establish an AFC Women’s Champions League and introduce annual AFC youth competitions, highlights Al Romaithi’s commitment to growing the game for all. “We need to modernise our failing football system and create more opportunities to play the beautiful game,” said the man who represented Al Ain FC, the UAE’s most decorated football club, at youth level. Al Romaithi is committed to delivering more competitive football for every age group. He will reinstate U13 eight-a-side regional festivals for boys and girls, and he will ensure all U14-U23 teams have the opportunity to play regular international fixtures every year. From becoming chairman of his beloved Al Ain FC to serving as an AFC Executive Committee member, Al Romaithi has spent the past 20 years at the heart of the Asian sports community and understands every level of football governance. If elected, Al Romaithi will establish five regional AFC development offices, publish detailed annual financial reports and create an independent office of budgetary responsibility. Under Al Romaithi’s leadership the AFC will become a confederation that decides issues for itself and achieves fair representation on the world stage. “I am committed to increasing the number of quota places available for Asian teams at all FIFA competitions and ensure extra funding from FIFA is made available for all Member Associations,” he promised. Al Romaithi will begin a three-week tour of Asia sharing and discussing his manifesto for reform with football and sporting leaders across the region leading up to the AFC Session in Kuala Lumpur, Malaysia on April 6. “Football gives hope for a better world,” Al Romaithi said. “That is why I want to create a confederation that is based on excellence and that is fair and equal for all.